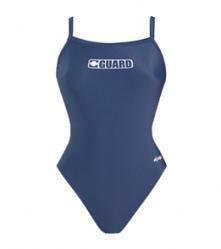 Dolfin Lifeguard Women's V-2 Back swimsuit is the perfect choice for lifeguards that want an inexpensive swimsuit that will last the entire season. Dolfin Lifeguard Swimsuit products are designed with everything in mind from coverage and comfort to UV protection and durability. The V-2 Back design provides full range of motion and the thin strap style will give you non-chaffing comfort that will keep you looking good and feeling great during those long days on the job. Dolfin offers many options within the same low price range.